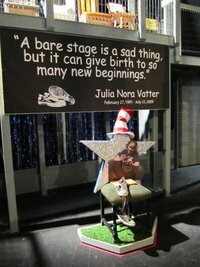 Some of you remember that Julia Vatter, an 18-year-old volunteer for the Bay Street Players in Eustis, was killed in a car accident in the summer of 2009. Since then, her friends and loved ones have created a beautiful program called Julia’s Chairs, which honors the young theater-lover by setting up an empty chair for her backstage in theaters from Eustis to Broadway. Julia’s 20th birthday would have been this Sunday, Feb. 27, and the goal is for as many theaters as possible to set up a chair backstage for her. Congrats to Amanda Warren, who has been appointed director of Bay Street Players’ Young People’s Theatre. Amanda, who is known for her work with her actor husband Joel, received a bachelor’s in fine arts from Cal Arts and has been artistic and education director of the Warren Theatre Company in Mount Dora for the past four years. Eustis’s community-theater group the Bay Street Players have bid good-bye to former executive director Michael Morman, who resigned for personal reasons, and appointed theater volunteer Bonnie Swanson as interim executive director. Morman had been in the post only since March 1, when he took over from longtime executive director Elizabeth Drew Scholl, whose family moved from the area. Swanson has been on the Bay Street board since 2008. She also has designed costumes for the theater. Before she worked as a volunteer for Bay Street, she spent many years volunteering for the IceHouse Theatre in Mount Dora. Bay Street will search for a permanent executive director. Jim Meadows recently became president of the Bay Street board. Other board members are Charlotte Jardine, Debra Sussman, Tim Totten, Nina Vatter, Thomas Young, Kelly Bayne, Cindy Satur, Beth Breese, Marilyn Budzynski, Mary Hays and Lynn Herrick. Members serve three-year terms. Here’s an audition notice for Bay Street Players’ production of Ragtime. Note: The auditions are coming up fast — Monday and Tuesday, April 19 and 20. Bay Street Players will hold auditions for the Tony Award-winning Ragtime, The Musical on April 19 & 20 at 7:30PM at 109 N. Bay Street, Eustis. Artistic Director David Clevinger is looking for an ethnically diverse cast, including a large ensemble ranging in age from 7-80. Newcomers are welcome. Those auditioning are requested, but not required, to prepare a musical selection, preferably in the style of the production, and to bring sheet music in their key. An accompanist will be provided. In addition, some may be asked to read selections from the script. Anyone not interested in performing onstage is invited to join our team of volunteers and to learn of backstage opportunities needed for this production. Ragtime is a musical with a book by Terrence McNally, lyrics by Lynn Ahrens, and music by Stephen Flaherty. Based on the 1975 novel by E. L. Doctorow, Ragtime tells the story of three groups in America, represented by Coalhouse Walker Jr., a Harlem musician; Mother, the matriarch of a WASP family in New Rochelle, NY; and Tateh, a Latvian Jewish immigrant. Historical figures such as Harry Houdini, Evelyn Nesbit, Booker T. Washington, J. P. Morgan, Henry Ford, Stanford White, Harry Kendall Thaw, Admiral Peary, Matthew Henson, and Emma Goldman also appear. The music includes marches, cakewalks, gospel and ragtime. Ragtime is generously sponsored in part by Bowen Radson & Schroth, United Arts of Central Florida, and the City of Eustis. Please contact the theatre at (352) 357-7777 or visit the web site at www.baystreetplayers.org for directions or for further information. Bay Street Players is a 501 (c) 3 non-profit community theatre celebrating 35 seasons of live theatre in the historic 1922 State Theatre in downtown Eustis. You don’t often get a chance to see A Little Night Music, Stephen Sondheim’s glorious testament — in waltz time — to the foolishness of love. So here’s good news: Bay Street Players are holding over their production, which I saw and enjoyed last month. Here’s the story.